Looking for dead insects may be an unusual undertaking, but jewelry designer Julie Gootee makes it an integral part of her craft. 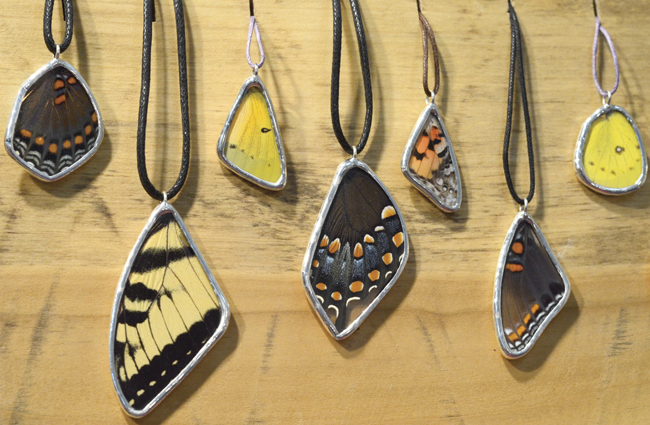 Gootee finds butterfly wings on roadsides and gives them new life as pendants for her jewelry company, The Butterfly Road. These wings are not only beautiful, she says, they also carry an environmental message. Gootee’s livelihood depends on a thriving population of butterflies, as she does not buy, raise, or catch them. Venturing out a few days a week last year, she was able to collect more than 100 butterfly wings per day, mostly tiger swallowtails. This summer, on the same stretch of highway, she inexplicably found only a dozen each day—primarily buckeyes and red admirals. Before collecting butterfly wings, Gootee pressed flowers, peacock feathers, and even small pieces of music-album artwork between sheets of glass to make pendants for necklaces and earrings. After a successful experiment with butterfly wings, her search for butterflies began. Around the same time, she founded her jewelry company named in honor of the butterflies she finds and her former days on the road selling her jewelry at music festivals.